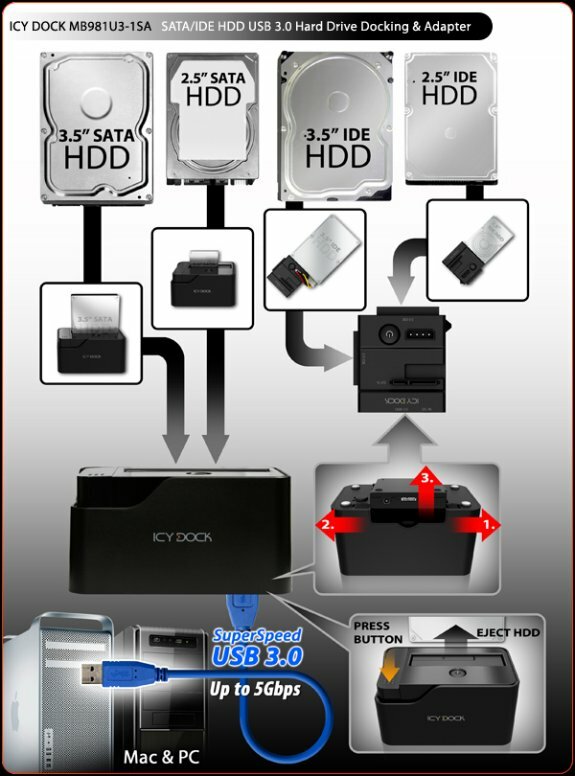 Icy Dock presents the MB981U3-1SA, a new 2.5"/3.5" SATA & IDE HDD/SSD docking station with the USB 3.0 interface. 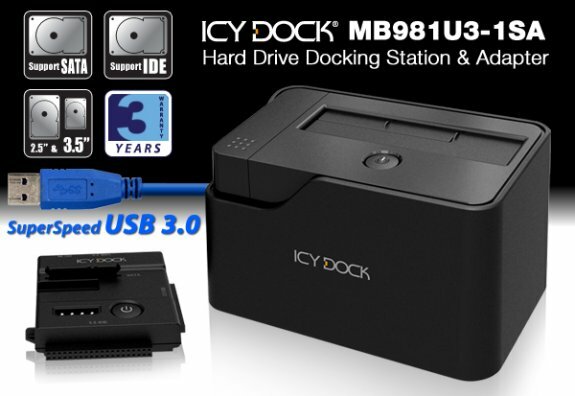 Icy Dock is proud to introduce a brand new item to its innovative product line, the MB981U3-1SA 2.5"/3.5" SATA & IDE Hard Drive Docking Station with SuperSpeed USB 3.0 interface. This product is packed with features and gives the term docking station a whole new meaning. The first feature of the device is a direct connection through the top slot for 2.5" and 3.5" SATA hard disk and solid state drives, allowing a user to access their drive via SuperSpeed USB 3.0. 2.5" drives can be used on the go being powered by the USB bus, while 3.5" drives utilize a small form factor wall power supply that can be easily stowed away in a laptop bag or briefcase. The anti-dust cover on the top is divided into 2 pieces, so that if a 2.5" drive is inserted, only the smaller portion of the cover opens up, leaving the electronics inside safe from dust and debris. The second feature of the MB981U3-1SA is the detachable adapter that releases from the bottom of the dock via 2 small lockable switches. Once the adapter is removed, IDE drives can then be used, as well as both types of SATA drives. 3.5" IDE drives connect to the labeled input, and is powered using the 4-pin power jumper cable. 2.5" IDE drives connect to the labeled input, and can be powered using only USB power. Using SATA drives with the disconnected adapter is the same as when they are directly docked through the top slot. Other useful elements include power buttons on the dock and adapter that double as status LEDs, a easy to press, large drive eject button, and as always, a standard 3 year warranty. * Completely screw-less / tool-less design for any type of drive. * Connects 2.5"/3.5" IDE HDD connected via USB 3.0 using the removable adapter. * Able to run 2.5"/3.5" IDE & SATA hard drive Simultaneously. * 2 part anti-dust cover protects internals even when small 2.5" SATA drive is used. * 2 locking switches hold the detachable adapter in place when used as a dock. * Easy access On/off button allows hard drive life expendability and energy conservation. * Plug & Play USB 3.0 with backwards capabilities to USB 2.0 for quick connection for any computer system. * Exposed working HDD stands in the air vertically for fast heat radiation. * USB 3.0 connectivity with up to 5 Gb/sec transfer rates. * Large eject button for hassle free drive removal. * Included 4-pin power jumper cabled provided for use with 3.5" IDE drive. * Built in compartment to hold 4-pin jumper. * Low profile power adapter for 3.5" drives. * USB bus power for 2.5" drives. * Great for DIY users and IT Professionals. * Designed for PC & Mac systems.